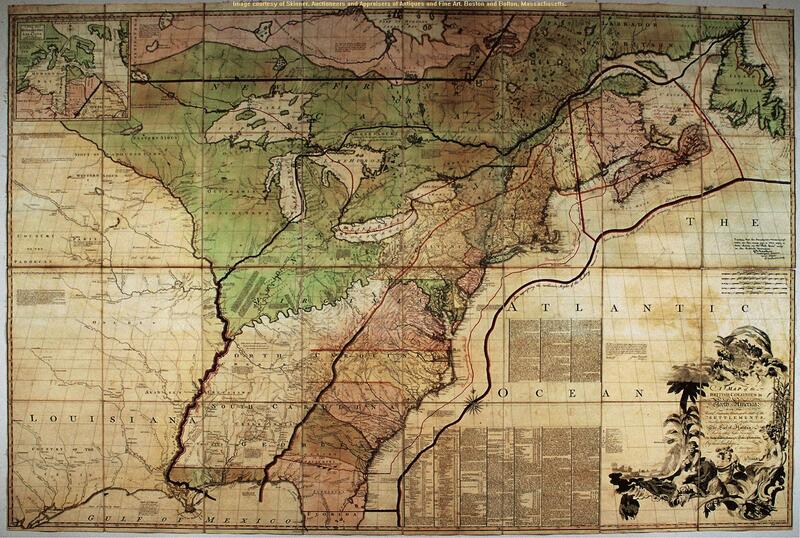 ^ Northwest Ordinance; July 13, 1787. The Avalon Project at Yale Law School (accessed May 12, 2006). ^ John Mitchell's Map, An Irony of Empire Archived 2008年5月20日, at the Wayback Machine. ^ Mitchell map Archived 2006年5月23日, at the Wayback Machine.. University of Southern Maine (accessed May 12, 2006). ^ Mendenhall, T.C. & Graham, A.A. (1896). Boundary Line Between Ohio and Indiana, and Between Ohio and Michigan. 4 Ohio Archaeological and Historical Quarterly 127, 154. ^ a b c Geography of Michigan and the Great Lakes Region The Toledo War Archived 2006年8月20日, at the Wayback Machine.. Michigan State University (accessed May 12, 2006). ^ Mendenhall & Graham, op. cit. at 162. ^ a b c d e f The Toledo War. Michigan Department of Military and Veteran Affairs (accessed May 12, 2006). ^ Mendenhall & Graham, op. cit., at 154. ^ The Great Black Swamp Historic Perrysburg Archived 2007年2月18日, at the Wayback Machine. (accessed May 12, 2006). ^ Meinig (1993), pp. 357, 363, 436, and 440. ^ The Great Black Swamp Archived 2007年2月18日, at the Wayback Machine.. Historic Perrysburg (accessed May 12, 2006). ^ Mendenhall & Graham, op. cit., at 167. ^ S.013 Monument. Detroit Historical Society and Detroit Historical Society (accessed August 10, 2006). ^ Important Dates in Michigan's Quest for Statehood. State of Michigan (accessed May 12, 2006). ^ Galloway, op. cit., at 214. ^ Way, op. cit., at 19. ^ Galloway, op. cit., at 216. ^ a b Mitchell, Gordon (July, 2004). Corner: Ohio-Michigan Boundary War. Part 2. 24 Professional Surveyor Magazine 7. ^ The Ohio Michigan Boundary War : Battle of Phillips Corners Marker #2–26 Archived 2015年11月22日, at the Wayback Machine.. Remarkable Ohioan (accessed May 13, 2006). ^ Galloway, op. cit., at 217. ^ Wittke, op. cit., at 306. ^ Galloway, op. cit., at 220. ^ Ibid. See also Baker, Patricia J. Stevens Thompson Mason. State of Michigan (accessed May 13, 2006). ^ Galloway, op. cit., at 227. ^ Way, op. cit. at 28. ^ Wittke, op. cit., at 306. Two Stickney's brothers, One and Three, were also active in the fight. ^ Dunbar, Willis F. and May, George S. MICHIGAN: A History of the Wolverine State. 216. ^ Galloway, op. cit., at 221. ^ Mendenhall & Graham, op. cit., at 199. ^ Galloway, op. cit. Archived 2007年3月18日, at the Wayback Machine., at 228. ^ Wittke, op.cit., at 318. ^ Baker, Patricia J. Stevens Thompson Mason. State of Michigan (accessed May 13, 2006). ^ Wittke, op. cit., at 318. ^ Michigan Quarter, U.S. Mint (accessed May 13, 2006). ^ History of the Upper Peninsula Archived 2006年9月5日, at the Wayback Machine.. Northern Michigan University (accessed May 13, 2006). ^ Terra Server USA. Microsoft (accessed May 13, 2006). ^ Michigan v. Ohio, 410 U.S. 420 (1973). Findlaw (accessed May 13, 2006). ^ A brief history of Turtle Island Captain-Johns.com (PDF) (accessed May 13, 2006). ^ Emmanuel, Greg (1960). The 100-Yard War : Inside the 100-Year-Old Michigan-Ohio State Football Rivalry at 8-9. Emmanuel's first chapter, "Hate: The Early Years," cites the origins of the 100-year competition between the two football teams as being borne out of the unfulfilled bloodlust of the militia troops. Emmanuel, Greg (1960). “Hate: The Early Years”. The 100-Yard War : Inside the 100-Year-Old Michigan-Ohio State Football Rivalry. New York: John Wiley & Sons. pp. 9–10. ISBN 0-471-67552-0. Galloway, Tod B. (1895). The Ohio-Michigan Boundary Line Dispute. 4 Ohio Archaeological and Historical Quarterly 213. Mendenhall, T.C. & Graham, A.A. (1895). Boundary Line Between Ohio and Indiana, and Between Ohio and Michigan. 4 Ohio Archaeological and Historical Quarterly 127. Wittke, Karl. (1895). The Ohio-Michigan Boundary Dispute Re-examined. 45 Ohio Archaeological and Historical Quarterly 299. Bulkley, John McClelland (1913). “Toledo War”. History of Monroe County, Michigan : a narrative account of its historical progress, its people, and its principal interests. Chicago: Lewis Publishing. pp. 137–161. http://www.hti.umich.edu/cgi/t/text/pageviewer-idx?c=micounty;cc=micounty;q1=Port%20Lawrence;rgn=full%20text;idno=BAD0978.0001.001;didno=BAD0978.0001.001;view=image;seq=00000171 2006年5月8日閲覧。. Greene, Merritt (1960). Curse of the white panther: A story of the days of the Toledo War. ASIN: B0007FFL70. Hemans, Lawton T. (1920). Life and times of Stevens Thomson Mason: The boy governor of Michigan. ASIN: B00085CSF2. Karl-George, Mary (1971). The rise and fall of Toledo, Michigan: The Toledo War!. ASIN: B0006W1902. Michigan Historical Society (1960). The facts and historical events of the Toledo war of 1835. ISBN 1-4181-9926-5. Tuttle, Charles R. (1873). “Chapter XXXI”. General history of the state of Michigan: with biographical sketches, portrait engravings, and numerous illustrations.. Detroit: R.D.S. Tyler. pp. 448–479. http://www.hti.umich.edu/cgi/t/text/pageviewer-idx?c=micounty&cc=micounty&idno=bac8789.0001.001&q1=Vistula&frm=frameset&view=image&seq=454 2006年5月8日閲覧。. It might also be mentioned that Indiana tore off their own strip of land at Michigan's expense at about the same time. There is a state historical marker commemorating the event at the location of the former boundary, just south of South Bend, Indiana. Therefore, had things been different, South Bend and Notre Dame would both be located in Michigan. "Boundary Line between Ohio and Indiana, and between Ohio and Michigan" Special Reports of T.C. 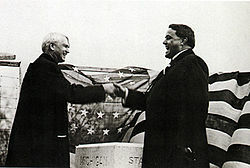 Mendenhall, Superintendent of U.S. Coast and Geodetic Survey, and A.A. Graham, Secretary of the Ohio Historical Society, in Ohio History Vol. 4 pp. 127–198. "The Ohio-Michigan Boundary Dispute" by Tod B. Galloway in Ohio History Vol. 4 pp. 199–230. "The Ohio-Michigan Boundary Dispute Re-examined" by Carl Wittke in Ohio History Vol. 45, pp. 299–319. The Toledo War Michigan Department of Military and Veterans Affairs. Text of Michigan V. Ohio, 410 U.S. 420, the 1973 合衆国最高裁判所 decision resolving Michigan-Ohio boundary at Lake Erie. Michigan Historical Markers. The marker for the Frostbitten Convention.